I’m just back from a 6-day road trip to commune with the Michigander Sister in the Michigander Sister’s new home. Guess I can’t call her Michigander Sister anymore. She’s livin’ the agricultural life in the Land of Lincoln, aka the Prairie State. These are the kinds of thoughts that hurt my brain after romancing the road. We zipped through Michigan, beetled through Indiana, and wandered in the wilderness in Illinois. It was corn and soybeans for as far as the eye could see. It was one lane roads, that zigged here and zagged there, through field upon field of corn and soybeans, soybeans and corn. The sun shone every day. I ate the best ice cream I’ve ever had — but that’s gonna require a post of its own — and met some really fine folk. The only sounds were the trains, tractors, and cicadas. Oh. And the quadcopter. Yup. Another post. It was the land of tractors, so you know I want to move there, right? Also, the B-I-L (brother-in-law) has the sweetest Harley I have ever seen. You have to be an early riser to get a ride. I didn’t get a ride. Happy first Hump Day of October. p.s. That shot was taken on the long driveway to the mailbox, between the corn fields and the soybean fields, somewhere in the Land of Lincoln. Make that the Prairie State. 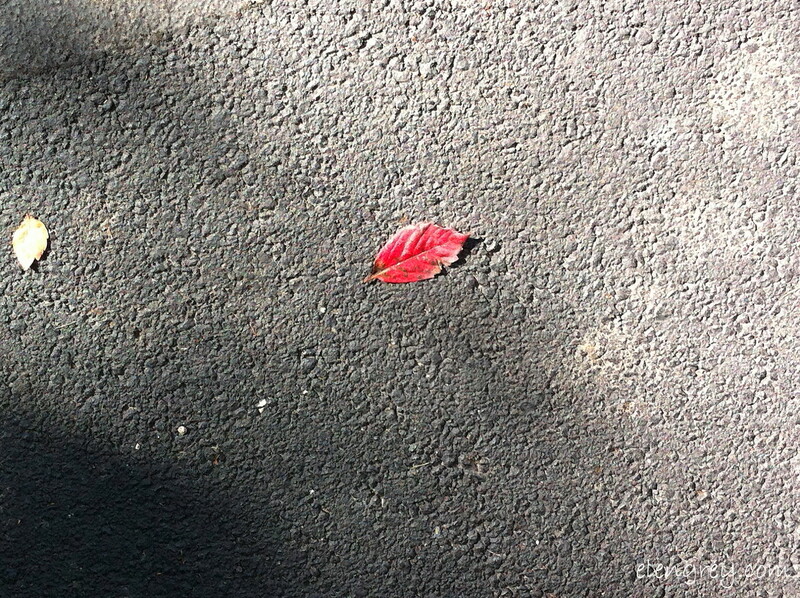 I would have never noticed that beautiful little red leaf. I always have to remind myself to look down when I’m shooting. She’s a beaut. Love the post Elen. Your shorty bio made me laugh out loud. You are not alone. I think I could write about anything or anyone but myself. That red leaf made me happy all over. Thank you, Kellie! I hear ya. I feel the same way about that red leaf. Cheers!